Want to know how to make homemade Kind Bars? Try this Kind Bar recipe copycat. 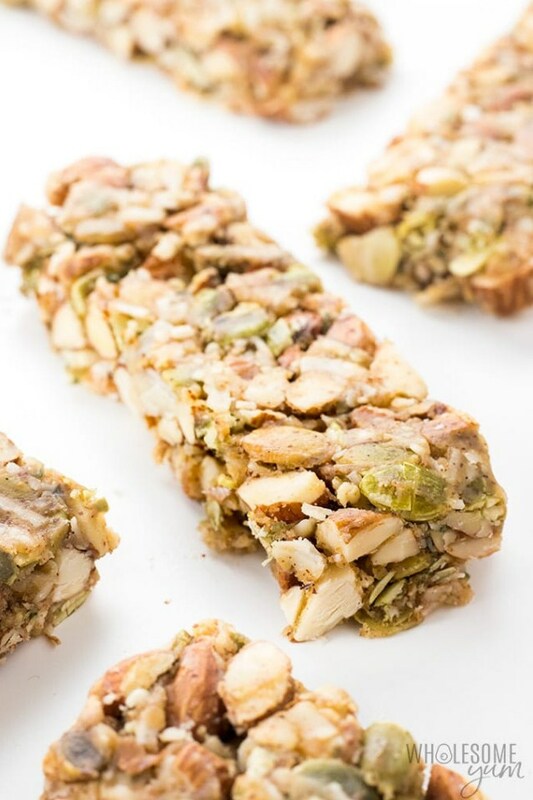 They're the easiest low carb, gluten-free, sugar-free granola bars ever. Line a 8x8 in (20x20 cm) baking pan with parchment paper. In a large bowl, stir together the almonds, pumpkin seeds, coconut flakes, and hemp seeds. Set aside. In a large saucepan, heat the fiber syrup, almond butter, powdered erythritol and sea salt for a couple of minutes, until easy to stir. Stir until smooth. Remove from heat. Stir in the vanilla extract and vanilla bean seeds. Stir the syrup mixture into the nut mixture. Transfer the mixture to a lined baking dish and press firmly to create a smooth top. Use a large, flat spatula to create an even flat surface and press down firmly. Cool completely on the counter. When fully cooled, gently lift the parchment out of the pan and transfer on top of a cutting board. Use a sharp chef's knife to cut into bars using a firm downward motion (don't see-saw back and forth).